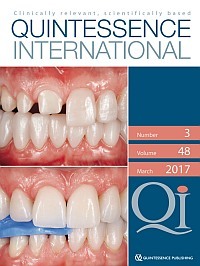 Single back issues of Quintessence International are available for purchase at a cost of $23.00 per issue. You will need to know the volume, issue number, and year of the journal you wish to purchase. If you are not a subscriber and you wish to obtain access to single articles that are available online, you may do so by purchasing Pay-Per-View Access. Access the Qi home page, and select the Full-Text PDF of the article you wish to order. You will then be given the option to "Order This Article." Once you have placed the order, a PDF file will be sent to the e-mail address you provide within 1 business day. Please note that credit card payments for these services cannot be refunded.